I thought this was a clear abuse of authority (or I can't read straight). This question: https://stackoverflow.com/questions/10204862/write-a-program-to-multiple-a-matrix-of-size-nm-in-java was closed as "not being a real question". The StackOverflow official text states: "It's difficult to tell what is being asked here. This question is ambiguous, vague, incomplete, overly broad, or rhetorical and cannot be reasonably answered in its current form." If there was any violation of policy (and I think there wasn't), it was in my answering it because SO members SHOULD not give direct answers. I doubt if even that is grounds for deleting an answer or question. But that is definitely not grounds to close the question. Just the URL tells exactly what's being sought. It is an extremely precise question. Are we a rule-based community, or caprice-based where we apply an arbitrary rule because we are pissed-off? Have you read the comments below the question, if no then read them again and you will know the problem. SE is not made for spoon-feeding, its only to help you not to work on your behalf without your own hard work. So, this question is closed because question is incomplete and the user have not tried any single line of code by his ownself. 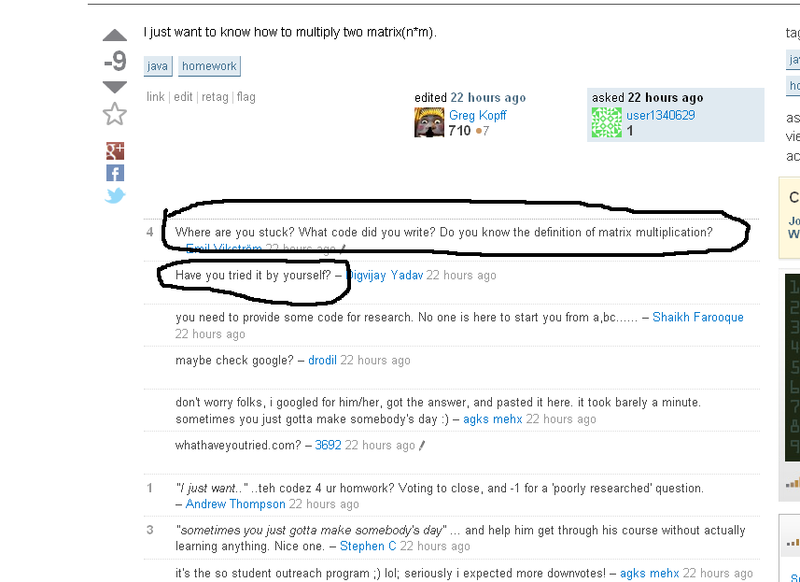 And asking to write whole code by others, that's not right and these type of question are not welcome in this community. For the record, I stand behind my close vote on this question. This is by no means a "clear abuse of authority", as illustrated by the fact that four others voted to close, nine people downvoted it, and three others voted to delete the question. The community clearly found something wrong here. Write a program to multiple a matrix of size (n*m) in java? while containing a question mark, has the tone of asking us to do the user's work for them. People respond very poorly to being commanded to do someone's job / homework for free. I just want to know how to multiply two matrix(n*m). is just a single line, with no question in it. It's also asking for a common task whose implementation can be found elsewhere. As was pointed out in this Meta question the "not a real question" close reason is being applied to trivial / general reference questions, but a new close reason may be created for these based on some of the confusion around the "not a real question" wording. The user also doesn't provide any context for what they're trying to do, the constraints on their problem, etc., so it could be considered to be too broad to answer exactly. The overwhelmingly negative response this question received most likely comes from the fact that we see piles of these sort of lazy, "do my work for me" questions come in here every day. These are the kinds of questions that cause experts to get fed up and leave, and Stack Overflow is structured to prevent the kinds of collapses due to this that have occurred in almost every other programming-related mailing list or forum I've participated in. We're doing what we can to keep the signal to noise ratio high here as the site scales to an incredible amount of question and answer traffic. That sometimes means we prune questions like this to maintain the overall site quality. If I may comment on the negative response to your answer, two things bothered people there. First, spoon feeding answers to help vampires like this is starting to get frowned upon here, because that just encourages others to come here and have others do their work for them. The second, and most important, criticism people had was that you just copied and pasted someone else's code without checking it yourself or providing any summary of what it does. As others commented, it turned out to be broken, which is harmful to have in an answer. Far too many people copy and paste code from Stack Overflow into their projects, so having buggy code here can be a real problem. So no, this wasn't an "abuse of authority", this was an unsalvageable question and it deserved to be closed and deleted. The short answer is: "the latter". Stackoverflow has very clear policies about questions meet its standards. The first answer gave the official reference. Stackoverflow also is very careful about expanding the standards about which questions are disallowed. The second answer gave a great example of such a discussion and the conclusion reached. The original question "Write a program to multiple a matrix of size (n*m) in java?" did not violate any of the standards listed in the official reference provided in the first answer. Yet, the person cited it as the basis for closing the question. The second answer cited a different basis for closing the question -- the discussion mentioned above about expanding the standards about which questions are disallowed. However, the discussion cited had reached the exact opposite conclusion (clearly tagged "status-declined" by moderators) that such a standard for disallowing questions was prone to abuse and hence rejected. I. e. the standards cited as a basis for closing were no basis for closing the question (please read them yourself if you feel I missed something). I found this very Orwellian, and based on this the answer to my above question seems to be that the community will act on feelings rather than codified standards; yet it will cite those standards to give the impression that the community does act on the basis of codified standards. Furthermore, merely discussing this on meta was correlated with the original question to further be deleted (not just closed). Not the answer you're looking for? Browse other questions tagged discussion stack-overflow specific-question closed-questions deleted-questions . Why was this closed as “not a real question”? Why is this question closed and downvoted? Why was this question closed as “not a real question”?